As I mentioned yesterday, I've been Editor-in-Chief for a year. 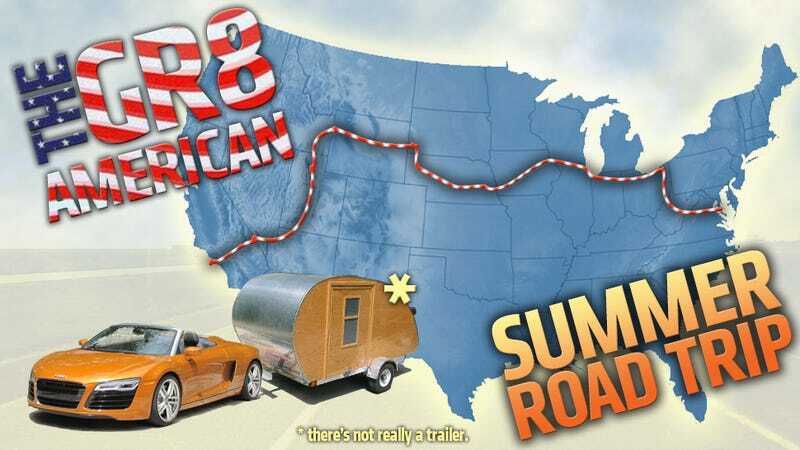 In light of that, I'm taking a week off to drive an Audi R8 Spyder from Los Angeles to D.C. Here's a general outline of the path I'm taking, where should I stop along the way? I&apos;ve Been Editor For A Year, How Am I Doing? Here comes the full disclosure, if you're interested: Audi wanted to get one of their R8s from the recent launch in Malibu back to the East Coast so journalists here could enjoy one so badly they asked for a volunteer. I quickly agreed. They provide the car and the gasoline, I provide the flight, hotel, food and other random items needed. I've put up this great map of my intended route, created by Jason Torchinsky, so you can annotate it and tell me where to stop for food, a great photo, a great drive, or some sort of weird roadside attraction. As time permits, I'll try and stop by as many of them as possible. It's about the journey, not the destination. "Between here and there is better than either here or there." If you're curious, the car is a new Audi R8 Spyder with a V8 in a slightly burnished orange color called Samoa. It's a tough life. It's a small car so I'm going to be packing light (more on that later) but I'll bring a camera and a phone so I can post pics every day from the road. I'll also answer your questions about the car and the trip. This is my first time driving cross-country from West-to-East so any advice you have is appreciated. You can also follow along by using the hashtag #gR8trip (also used for a trip to the gravesite of a serial killer for some reason) or just following me on Twitter.